I'm trying to add a dynamic import segment in the IDA database which contains functions names, and I'm applying type information to it, so that I can obtain argument locations by using apply_callee_tinfo when I found a call to this dynamic imported function. While I'm testing I found that for some of the declarations, the argument or return type is not able to identify. The IDA is giving a numeric type. declarations is a dict with key as the function name and value as the declaration. What am I doing wrong in this? Edit: My approach is based on the answers provided in this thread, In IDA, is there a way to add a reference to a dynamically imported function into the Imports tab?. My problem is not with adding import segment or creating cross references. But I'm unable to add type information to a name. 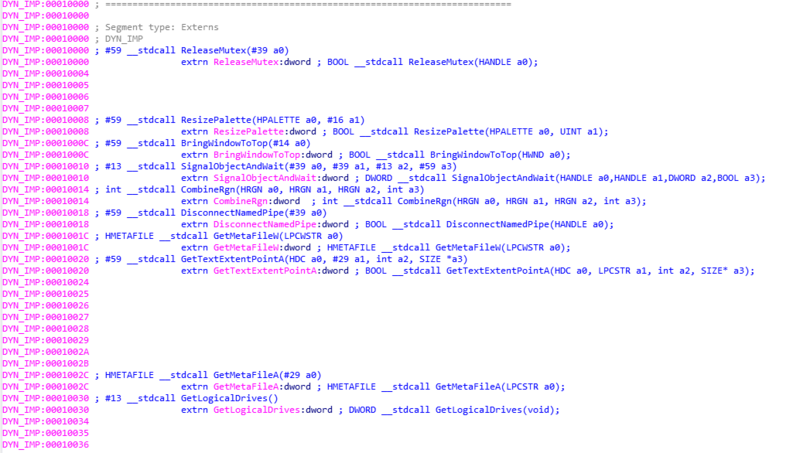 As you can see from the image, I'm trying to apply declaration BOOL __stdcall ReleaseMutex(HANDLE a0); at location 0x10000 which is named ReleaseMutex, but IDA is not able to identify BOOL and HANDLE structures even after parsing the declaration successfully. Browse other questions tagged ida binary-analysis idapython idapro-sdk ida-plugin or ask your own question. In IDA, is there a way to add a reference to a dynamically imported function into the Imports tab? Call to an imported function in a PE file: Why is destination prepended with ds (call ds:func_name)?